North America & Europe PEGylated Drugs Market size was valued over USD 7.7 billion in 2017 and is expected to witness more than 5% CAGR from 2018 to 2024. Rising prevalence of chronic diseases including cancer in developed regions coupled with increasing R&D spending by pharmaceutical and biotechnology companies will drive the PEGylated drugs market size. As per American Cancer Society, over 15.5 million Americans are living with cancer and more than 1.7 million new cases are anticipated to be diagnosed in 2018. This will foster demand for PEGylated drugs in the future. Growing biologics sector such as, new advances in cell therapies, immunotherapies, antibody drug conjugates, gene therapies will offer immense growth opportunities in the future. Increasing acceptance of biologics drugs such as, monoclonal antibodies, colony stimulating factors, and interferons for treatment of chronic diseases will upsurge revenue share of PEGylated drugs in developed regions. However, drug recalls and adverse drug reactions associated with pegylated drugs will hinder business growth during the forecast timeframe. Cancer accounted for over 60% of the industry share in 2017. This is attributable to increasing prevalence of cancer along with advancements in the field of cancer research. Increasing usage of advanced drug delivery systems with PEGylation technology is significant in the field of anti-cancer therapy due to ability of PEGylation to enhance retention time of therapeutics. Launch of Neulasta Onpro Kit in the U.S. for self-administration of Neulasta drug at homecare settings post chemotherapy is another major factor boosting segmental revenue size. 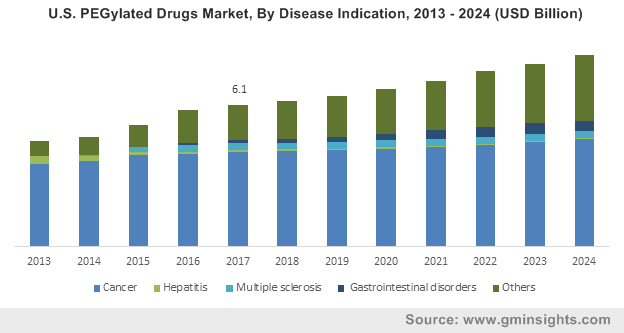 Gastrointestinal disorders will witness 19% growth over the forecast period owing to increasing adoption of pegylated drugs for treatment of gastrointestinal diseases. Launch and approval of pegylated drug such as Movantik used for the treatment of opioid-induced constipation (OIC) in adult patients will foster segmental growth. Colony stimulating factors (CSFs) held more than 55% of the overall market share due to growing number of cancer cases and wide applications of CSFs in cancer treatment. Advantages offered by Pegylated form of granulocyte stimulating colony factor (G-CSF) such as minimized risk of infection in patients undergoing chemotherapy, reduced incidence and duration of febrile neutropenia will upsurge segmental growth. Monoclonal antibodies (mAbs) will grow substantially over the forecast period to exceed USD 3.5 billion by 2024. Increasing usage of pegylated monoclonal antibodies in the field of anti-cancer therapy and other chronic ailments will propel market growth. For instance, development of Cimzia containing Certolizumab that blocks the tumour necrosis factor and helps in the treatment of Rheumatoid Arthritis will accelerate market growth. U.S. PEGylated drugs market size was over USD 6 billion in 2017 and is expected to surpass USD 8 billion by 2024. Significant market growth can be attributed to growing incidences of cancer along with rising mortality rates associated with chronic ailments in the country. Additionally, U.S. attracts most of the worldwide project capital investments in start-up biopharmaceutical enterprises. Availability of approved pegylated drugs along with numerous drugs in pipeline will foster business growth. Moreover, rising usage of biologics along with various awareness drives planned by government upsurges PEGylated drugs revenue size. Germany held over 20% of the regional business share in 2017. The market will witness over 9% CAGR owing to the presence of local manufacturers developing activated PEGs used to produce PEGylated drugs. Emergence of biopharmaceuticals in the region will cater to the increasing demand for such drugs for the treatment of chronic disorders. 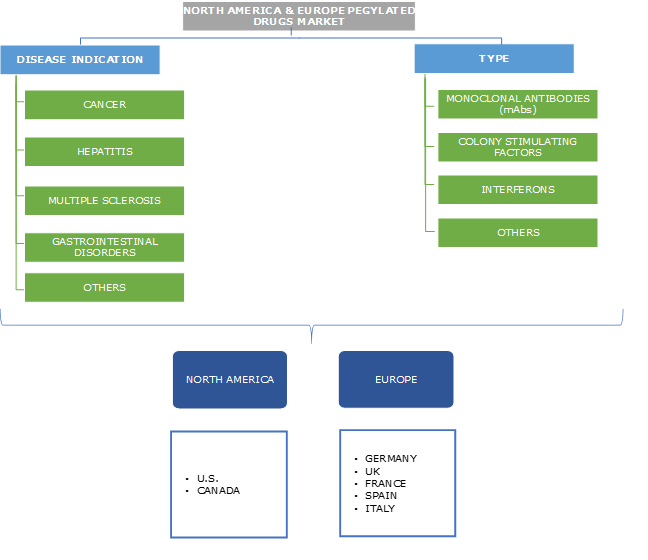 Some of the major players of North America PEGylated drugs market are Merck, Shire Group, Amgen, UCB, AstraZeneca, Sigma Tau, Pfizer, Roche, and Biogen. Prominent players are focusing on R&D activities for developing novel drugs using PEGylation technology for the treatment of chronic diseases to maintain their market position. Increasing efforts by government for reducing chronic disease burden owing to growing incidences of cancer in the region will drive industry growth. Rising R&D spending on PEGylated drugs as well as increasing funding for cancer research in the U.S. will further propel regional revenue size. Advancement in PEGylation technology along with growing biologics sector will offer immense growth opportunities in the future. Increased efforts of market players with robust pipeline of PEGylated drugs will further propel industry growth.